Cenote Dos Ojos, meaning “Two Eyes” in Spanish, got its name from the two Cenote entrances adjacent to each other. Located 20 minutes south of Puerto Aventuras and 2 kms into the jungle from the 307 federal highway. 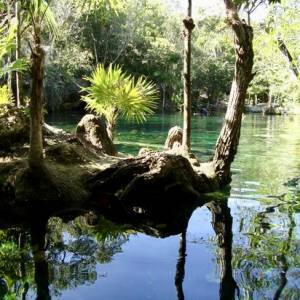 Dos Ojos is extremely popular and famous because of the IMAX film “Journey into Amazing Caves” released in 2001. Dos Ojos Cenotes are truly magical. 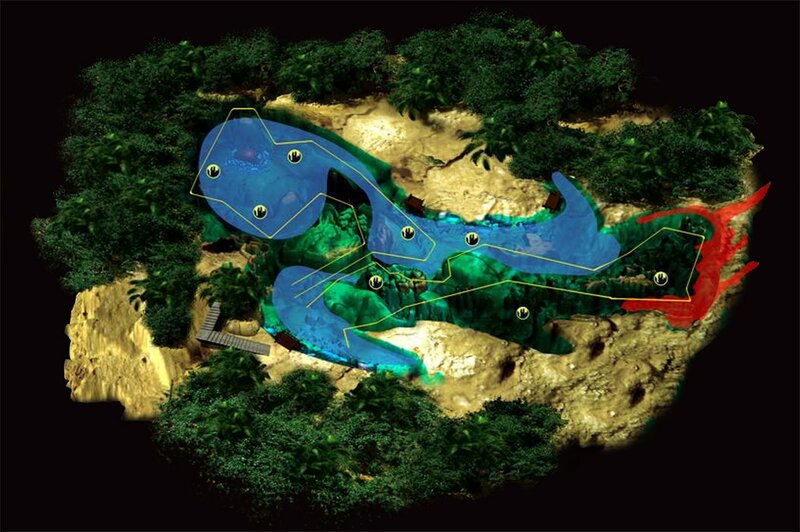 It has two beautiful Cavern dives: The “Barbie Line” and the “Bat Cave”. The first dive is usually the beautiful “Barbie Line” which leads the diver along the “second eye” allowing for plenty of natural light and amazing backlight effects. There is a lot of space, with huge columns, stalactites and fossils. Half way thru the dive, you are in the room where part of the IMAX documentary was filmed. The second dive is in the “Bat Cave”. This dive is just a bit more challenging as it is very fragile due to the mind blowing formations on the ceiling and the sediment deposits on the bottom. 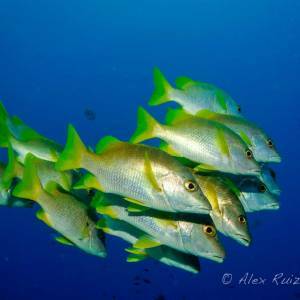 Due to these characteristics this dive requires excellent buoyancy control. 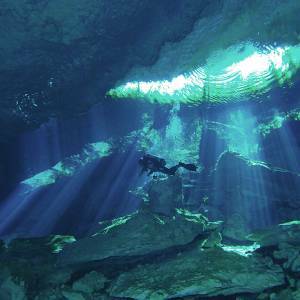 For Cave divers, the Dos Ojos System is a maze of different dives in this extensive cave system. 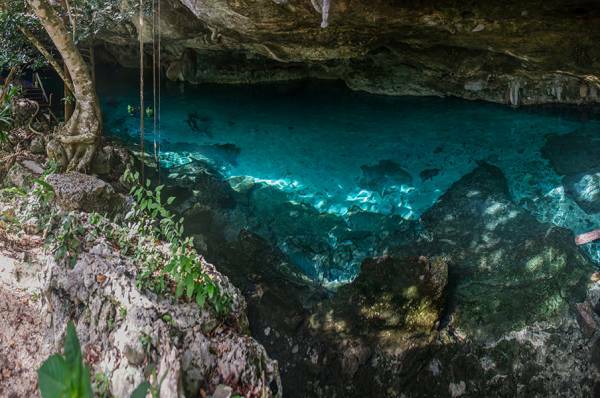 Dos Ojos is the fourth longest underwater cave systems in the world today. It has over 83 kilometers of explored passages and it keeps growing every day as cave divers keep finding more caves. 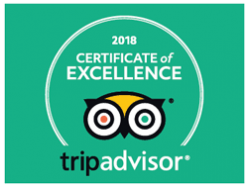 For non-divers, this is an excellent location for snorkeling where you can be dazzled by the crystal clear blue waters and formations under the overhang. 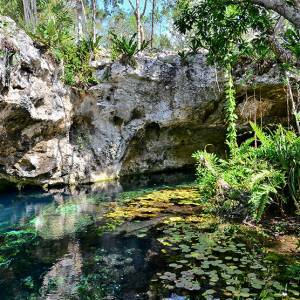 This Cenotes are probably the most visited in the Riviera Maya since it has the perfect conditions for everyone. Open water divers can dive this caverns guided by a professional cave diving guide while non divers can enjoy amazing snorkeling.